Breast cancer becoming a major threat now a day. About 45,000 women are diagnosed with breast cancer in the UK each year and about 60% have breast conserving surgery. The rate of re-excision rates following breast conserving surgery varies between 12% to 30%across the UK. The use of margin status and re-excision rate as a measure of quality is controversial. Specimen orientation kits are important as they can influence the re-excision rates. Here in this study, there is used a new specimen orientation kit called 'Klin tray' and assessed its impact on margins and re-excision rate. One in 8 women will develop breast cancer in their lifetime . Over recent years with the increase in early and screen detected breast cancers, wide local excision with adjuvant radiotherapy (collectively termed breast conserving surgery, BCS) has become the preferred treatment of choice as it has been shown to yield an equivalent survival compared with radical mastectomy [2,3]. The aim of BCS would be to excise all invasive and pre-invasive disease whilst paying particular attention to good cosmetic outcomes. Incomplete tumour resection has been shown to be associated with an increased risk of disease recurrence [4,5]. As such, the National Institute of Health and Clinical Excellence (NICE) recommend a minimum clear excision margin of 2 mm, although the evidence supporting this is poor . The Association of Breast Surgeons (ABS) of UK, having recognized this, favors multidisciplinary team discussions for implementation of local guidelines regarding acceptable marginal width . In addition, the ABS guidelines emphasized the importance of potential poor surgical specimen orientation leading to inadequate excision and local failure. The ABSGBI audit report (2013/2014) of the National Health Service Breast Screening Program (NHSBSP) reported that 14% of BCS in the UK had involved or unknown margin status. They therefore stated that surgeons should orientate cancer resection specimens with a code that is anatomically relevant and assists in accurate specimen and margin evaluation . Across the United Kingdom (UK), a wide range of intraoperative specimen labelling and orientation protocols are used to accurately identify the status of margins for potential re-excision. In 2013, a national cross-sectional study used questionnaires to identify that sutures short-superior, medium-medial, long-lateral) were the commonest protocol being utilized by 50 units; clips were also used with some units using ink and others sutured specimens to paper, foam, or margin map®. They further highlighted that close to a quarter of breast units had no specimen orientation protocol, despite ABSGBI guidelines, and that pathologists would like a standardized (local or national) marking system . The ‘KliniTray’™ (KT) system consists of a light synthetic board, with pre-attached radio-opaque topographic markers and a frame, which allows the relationship of the sample to the patient's body to be seen from the surgeon's perspective. In addition, it consists of topographic markers (‘cranial’, ‘caudal’, ‘lateral’ and ‘medial’), and ‘L’ (left) and ‘R’ (right) markers. The site of the tumour is marked on the breast diagram and with the radio-opaque frame (Figure 1). We discuss our experience with the KT and assess the rate of reexcision both intra- and post- operatively. A retrospective analysis of prospectively collected data of all consecutive patients who underwent BCS from January 2014 to January 2017 under a single senior surgeon was performed. The site of the tumour is marked on the breast diagram and with the radio-opaque frame and that demonstration of the KliniTray® specimen orientation kit showed in Figure 1a which is specimen fixation and shown Figure 1b which is after specimen fixation. Figure 1a: The KliniTray® specimen orientation kit before specimen fixation. 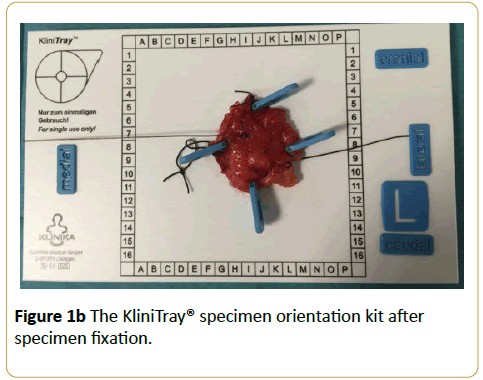 Figure 1b: The KliniTray® specimen orientation kit after specimen fixation. All specimens were orientated using KT and the application of marker clips. Intra-operative x-ray of the specimen was obtained to assess the adequacy of the excision margin Figures 2a and 2b. Figure 2a: Intra operative specimen x-ray. Figure 2b: Intra operative specimen x-ray. Any margin which appeared to be close to the tumour was further excised and sent for histological examination after fixation in formalin. Random cavity shaves were not undertaken as a routine procedure. A margin of 1 mm for invasive disease and 2 mm for ductal carcinoma in situ (DCIS) was considered to be adequate, in keeping with the West Midlands regional guidelines. Tumour close to but not involving the anterior and posterior margins were not excised, and tumour extending to the anterior and posterior margins were re-excised. The histology and the adequacy of excision were assessed both intra-operatively and following histologyA comparison was made with our previous 3 year data (Jan 2009- December 2012) which used standard orientation (SO) method of short-superior, medium-medial, long-lateral sutures. From a total of 235 specimens (Group 1), 37 patients had re-excision (re-excision rate of 15.7%). 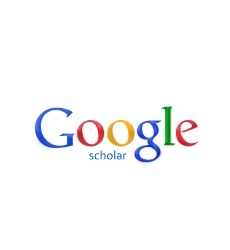 A chisquared analysis was done using SPSS; p<0.05 was defined as statistically significant. A total of 171 (Group 2) patients underwent wide local excision between Jan 2014 to Jan 2017. Age ranges between 30-90 years (median 50 years). 14 patients had re-excision of margins with a re-excision rate of 8.1%. The re-excised margin includes 4 medial, 1 medial and inferior, 1 medial and posterior, 4 superior, 3 lateral and 1 anterior and lateral margin. The Comparison of margin re-excision with specimen orientation using standard orientation (Group 1) and KliniTray® (Group 2) finding shown in Table 1. Table 1: Comparison of margin re-excision with specimen orientation using standard orientation (Group 1) and KliniTray® (Group 2). We found that the 37% of patients had DCIS and 40% had invasive disease and 23% had both DCIS and invasive disease. Of the invasive disease, 10% had lobular cancer of which all had MRI scan preoperatively to assess the extent of the disease as per local protocol. 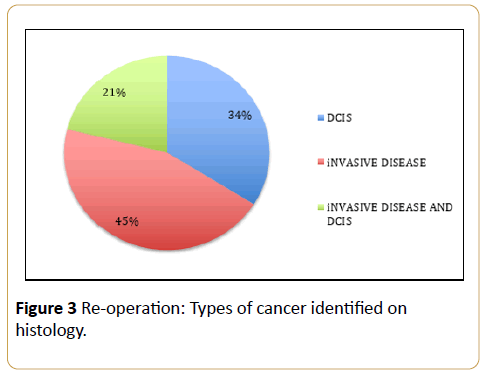 The findings of the re-operation associated with types of finding of the cancer shown in Figure 3. Figure 3: Re-operation: Types of cancer identified on histology. We found the orientation of the specimen especially in relation to the margins was easier. This could be since the tray was marked cranial and caudal and the clips identified the margin – Medial, lateral, superior and inferior. This facilitated the assessment of the tumour in relation to its position and the adequacy of the margin in all its dimensions. The pathologist also found it was easier to orient the specimen as its position was stable due to the fixture of the clips to the board. Our re-excision rate changed from 15.7% to 8.1% (although not statistically significant) with the use of the new specimen orientation kit. KT significantly reduced re-excision rate and involvement of margins. Indeed, this may suggest an improvement in histopathological evaluation due to more precise specimen orientation. It can be used to improve clinical practice by improving margin status interpretation. Further large prospective studies are required to determine whether the KT method is truly superior to standard orientation (SO) techniques alongside a cost-effectiveness analysis before national changes are suggested. Breast Cancer UK. Breast Cancer Statistics (BCUK Oct 2012) Available from: www.breast canceruk.org.uk/statistics. Veronesi U, Cascinelli N, Mariani L, Greco M, Saccozzi R, et al. (2002) Twenty-year follow-up of a randomized study comparing breast-conserving surgery with radical mastectomy for early breast cancer. N Engl J Med 347: 1227-1232. Barton MK (2015) Mastectomy and breast-conserving therapy confer equivalent outcomes in young women with early-stage breast cancer. CA Cancer J Clin 65: 335–336. Houssami N, Macaskill P, Marinovich ML, Dixon JM, Irwig L, et al. (2010) Meta-analysis of the impact of surgical margins on local recurrence in women with early-stage invasive breast cancer treated with breast-conserving therapy. Eur J Cancer 46: 3219-32. Bartelink H, Horiot JC, Poortmans P, Struikmans H, Van den Bogaert W, et al. (2001) Recurrence rates after treatment of breast cancer with standard radiotherapy with or without additional radiation. N Engl J Med 345: 1378-1387. National Institute of Clinical Excellence (2002) Improving outcomes in breast cancer: Manual update. Association of Breast Surgery at BASO (2009) Surgical guidelines for the management of breast cancer. Eur J Surg Oncol 1: 1–22. Association of Breast Surgeons (2015) National NHSBSP and ABS breast screening audit 2013/2014 Report. Volleamere AJ, Kirwan CC (2013) National survey of breast cancer specimen orientation marking systems. Eur J Surg Oncol 39: 255–259.